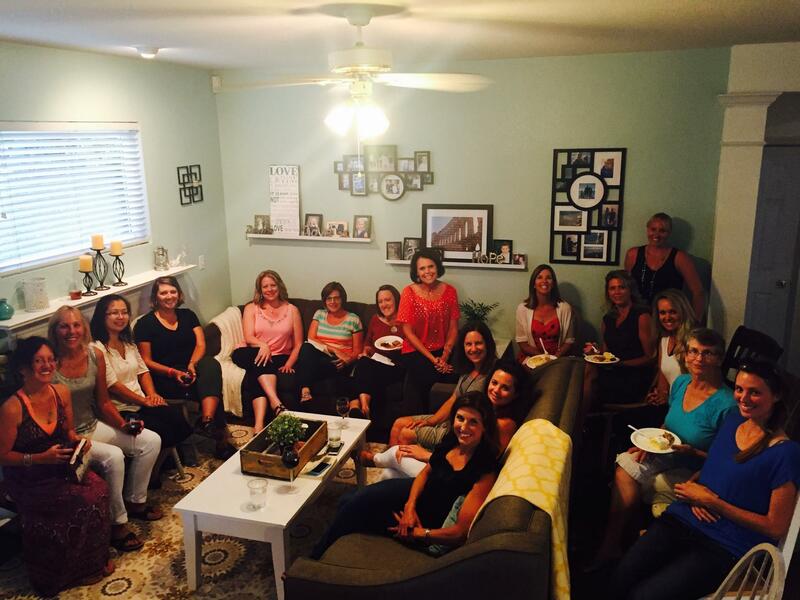 Twenty women of various ages and backgrounds gathered on a Tuesday night in an ordinary family room for book club. But the night was anything but ordinary. It was my first public speaking engagment in nearly a year. In spite of the temptation, I knew I couldn’t hide behind my front door forever, choosing to connect only via computer and cell phone. It was time to step out, to re-enter the world and learn how to live. Even so, the stepping out required a greater courage than I anticipated. We’re a culture that loves an “extreme makeover,” whether of the home or body kind. Before and after photos thrill us, connecting with our need to see circumstances and selves improve, get better. My extreme makeover was counter-cultural, you could say. The kind where you start out in pretty good shape and then, after months of demolition, come out broken. Who wants to watch that kind of trainwreck? Not exactly inspirational. As I climbed into my car and drove the few miles to the event, I felt a wave of awareness of how much I’d changed. I moved in a different body, one scarred from head to mid-thigh. My voice sounded foreign, in both tone an articulation. From the inside out, cell by cell, I’d been shredded. As my oncologist reminded multiple times, they’d taken me to “the brink,” pushed my body as hard as they could. Then, when it was clear I couldn’t withstand any more, they brought me back to life. There aren’t big enough words to describe the physical wrecking. Even after all these months, I’m still coming to terms with it. But the biggest changes, I knew, weren’t the physical ones. As a room of beautiful, authentic women circled around, sharing their hard stories and then allowing me to share mine, I knew with absolute clarity that the Michele I used to be didn’t survive. In her place, in that living room, sat a new woman. A remade woman. And while the pain of losing my old physical self still felt like a ripping, a thread of excitement started to weave through this reborn soul. Death—and this new life— had taught me incomparable lessons which, I knew, would change everything—for the good. Lesson #1: Very little is worth losing sleep over. You know that neighbor who keeps parking in your spot? And the coworker who talks too loud? And the church who won’t play your style of music? Frustrating, no doubt about it. But I have three words that could make a significant difference in your quality of life: Let. It. Go. (go ahead and read that goodness again). Imperfection is everywhere, especially in the people around you. Including you. So let it go. It’s not worth it. I don’t know anyone who approached the end of her life wishing she’d made a bigger deal about her neighbor’s dumb car. Lesson #2: Relationships matter far more than productivity or platform. I’m a businesswoman. I love being an entrepreneur, and I love being married to an entrepreneur. I thoroughly enjoy what I do, and plan to do it for as long as I’m able. Even so. My perspective on my earthly investments has sobered, significantly. The sun doesn’t rise and set on the success of a project, or on me. But I would spend my last hours of sunlight and my final breaths on the people I love. Lesson #3: Suffering is a ruthless—yet powerful—teacher. This lesson is as painful to type as I’m sure it is for you to read. No one wants to experience suffering. No one wants to feel pain. And yet suffering and pain are necessary to preserve life. We understand this from a physical standpoint. If my finger nears a flame, I pull back because of the sting. Pain saves my finger. Moreover, the wisdom gained from the encounter influences how I live, for the better. But when it comes to the heart, soul and mind, we’d rather avoid the struggle than learn from it. Here’s the catch: Whether or not you experience suffering isn’t really up to you. It’s an automatic condition of this thing called life. Better to embrace it and learn from it than waste it. Lesson #4: The only way to embrace life is to equally embrace death. We may turn our heads or squeeze shut our eyes, but death will not be denied. It’s reality, for every living, breathing human. Like it or not, I had to come to terms with this far sooner than I imagined. But rather than crushing me, it freed me. My main aim is no longer to extend my life, whatever the cost. Instead, my aim is to LIVE IT. To use the gift I’ve been given, for as long as I can. I will not let fear dictate my days. Will you? Lesson #5: The issue of faith is worth investigation. I won’t spend much time on this one, as I discussed it last week. But I will say this: If death is a reality and an 80-year life span is not a guarantee, the faith question and resulting conversation can’t be postponed. You don’t have to share my beliefs or claim any belief at all. The choice is yours, and I like you regardless. But if you haven’t invested significant time investigating the subject, you’re only cheating yourself. If you’ve faced a life-and-death scenario, how did it change you? What lessons did you learn? I’d love to learn from you. Leave your comment below. Amy, I love that. Let it Go. Slow Down. Let God. Good words! Michele, you know about my own life and death struggle these days, but this post made yet another difference in how I think about it all. I have been left with one side of my face, mouth, and head, in which the nerves were completely stunned during a brain surgery. They seem to be waking up VERY slowly (it’s been over 6 months now), but there is a possibility this numbing, stinging, aggravating feeling on one side of my face and left eye will completely heal. It affects my speech, my smile, my enjoyment of food (it feels like I took a huge gulp of extremely hot coffee), and I have spent too much time thinking, “If this goes away, I’ll do this, or that.” I need to think, “Regardless if this goes away or not, I’m going to live my life. I lived through this for a reason, and I need to get on with it, as best as this “new me” will allow me to. Thanks for the kick in the pants (again). Linda, I don’t know anything about you, but the scripture about beauty from your inner self is embodied in your words. And the Bible tells us the Word became flesh…you are proof of that. May God be with you! I also have damage to my facial (trigeminal) nerve. I’m very interested to find out how you are doing. Your attitude towards this is very inspiring to me. I’ve been in constant pain for almost 9 yrs. My pain level changes throughout the day but us always there. I know all about “numbing, stinging” pain. Thank you fir sharing your story. Deep and rich words – once again – Michele. Thanks. Oh Michelle, this is so profoundly, honestly put. The suffering is the one that’s always hard for me! When our church had a teaching about suffering years ago my eyes were opened to how essential suffering is to being a true Christ-ian. He suffered and told us to follow Him down the same path. In that suffering, as you have so beautifully illustrated, we are delivered of our temporal selves and renewed with eternal purpose. Thank you Michelle. I am so grateful to hear these words. You sharpen me as a woman, wife, mother and writer. I’m so honored to learn from you friend. These words so spoke to my soul today. How many times have I lost sleep over trivial stuff? Suffering indeed is an amazing teacher, oh how we fight it so! Thank you, thank you. One lesson I learned from many years of physical infirmity was how vital it is to receive with joy and gratitude the help given from others. Sometimes you don’t have a choice, other times you do, but either way, we choose how to receive it…begrudgingly or with the joy intended. I wonder if we sometimes forget all we have is from the Lord, and those people that minister to us are being sent by Him to bring exactly what we need. We should never forget that, or wish the “help” away. In humility, if we can receive it we bless the giver (and affirm their promptings from the Holy Spirit possibly) and the One who gives all good gifts. I still bristle sometimes when I’m laid up and someone offers to help me… like “I’ve got this, I don’t need anyone” but I try to keep in mind what I stated above, and to also remember how much I LOVE TO GIVE, and I would be robbing them of that chance to bestow blessing. Praying for you this week/weekend. You will go in the strength of the Lord, for he is sending you. What did I learn – 1. God gives you the grace you need at the time you need it – not more and not less and 2. things that I thought were a crisis prior to leukemia were not. I treasure these days moving into years – no every day has not been perfect and without trials but I love the opportunity to be shaped into the woman God wants me to be. I would love to hear you expound on how you walked through #4. I struggle with this one in various ways and would dearly appreciate the insight of one who’s walked the line so closely. If you do a post about that one day and you remember this request (ha), tag me or something on fb. I don’t want to miss it! Thoroughly enjoyed your post. Look forward to reading UNDONE. I am dealing with a disease I am encouraged by your words. God has met me on many an occasion to remind me of His faithfulness, thank you for your post. My experience with Life and Death occurred over the span of about one year, beginning when my husband developed serious complications following a surgery. His health continued to deteriorate, but I lived in denial, trusting and believing that God would heal him. He didn’t. My beloved husband and soulmate died at age 47, the day before our 23rd anniversary. While I had absolute assurance that he was now with the Lord in heaven, I struggled here on earth with questions as to why God would leave me with three children, age 12, 17 and 20 to finish raising by myself. My husband was good with teenagers; I was good with young children. And our entering-adolescent was my greatest challenge. “What were you thinking, God?” The greatest lesson I learned was to lean on God. I prayed constantly, seeking wisdom, and asking God to be a father to my children and a husband to me, as promised in the Bible. Fourteen years have passed, and God has blessed my now-grown children and me in countless ways. We all have come to appreciate the years we had with their dad, and the special times we now have when we get together. Michele, thank you for sharing your heart and experiences through the book, “Undone”. One of the most practical and insightful books I’ve read. Thank you for your transparency! I have had a couple of life experiences that could have ended in death–melanoma in 2004 and a heart attack in 2011. I have also had numerous surgeries, both minor and major that produced a lot of testing, pain and recovery. I have come to say that God has always used my health to keep me dependent on Him, because otherwise I would just run ahead of Him and out of His will. In the meantime He gave me the privilege of serving in full-time ministry for twenty-six years in the same church, through many staff changes, teaching differences, and philosophical differences re ministry. He asked our family to stay as staff as others came and left. God has taught me that death is not to feared, but neither is life. He has taught me that if I want to experience JOY, I must be willing to embrace suffering and sorrow, too. He has taught me that He is sovereign, sufficient for the day, and my Audience of One. Thanks for your faithfulness, Michele, to tell the truth about what is hard, but good. You really do encourage me. Michelle: Your candor and revelations in this post are extraordinary and I can feel the hard won wisdom you put into it. My story is as a caregive to my first husband who died when I was 38. I encourage you to read on my blog, A Time to Fight and a Time for Faith. I hooe it encourages you as you do others. The greatest lesson I learned was to live without regrets. God bless you and God blesses us through you.